Muñoz, J.J.; Asadipour, N.; Albo, S.
Soft active tissues exhibit softening, hardening, and reversible fluidisation . The result of these non-linear behaviour is due to multiple processes taking part at di erent scales: active protein motors that actuate at the polymeric structure of the cell, (de)polymerisation and remodelling of the cytoskeleton, and cell-cell connectivity changes that take place at the tissue level. We here present a cell-centred model that takes into account the underlying active process at the cytoskeleton level, and allows for active and passive cell-cell reorganisation and intercalation . Cell-cell interactions are modelled through specific non-linear elastic laws, and coupled active deformations . Cell-connectivity and cell boundaries are respectively determined with Delaunay and Voronoi diagrams of the cell-centres. The model is compared against different experimental measures of apparent cell viscoelasticity. Passive cell reorganistation and the active cell shape changes that take during embryogenesis will be also compared against continuous models. Soft active tissues exhibit softening, hardening, and reversible fluidisation . The result of these non-linear behaviour is due to multiple processes taking part at dierent scales: active protein motors that actuate at the polymeric structure of the cell, (de)polymerisation and remodelling of the cytoskeleton, and cell-cell connectivity changes that take place at the tissue level. We here present a cell-centred model that takes into account the underlying active process at the cytoskeleton level, and allows for active and passive cell-cell reorganisation and intercalation . Cell-cell interactions are modelled through specific non-linear elastic laws, and coupled active deformations . Cell-connectivity and cell boundaries are respectively determined with Delaunay and Voronoi diagrams of the cell-centres. The model is compared against different experimental measures of apparent cell viscoelasticity. Passive cell reorganistation and the active cell shape changes that take during embryogenesis will be also compared against continuous models. 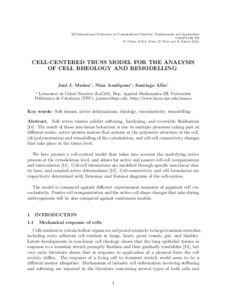 Muñoz, J.; Asadipour, N.; Albo, S. Cell-centered truss model for the analysis of cell rheology and remodelling. A: International Conference on Computational Plasticity Fundamentals and Applications. "Computational Plasticity XII: Fundamentals and Applications. Proceedings of the XII International Conference on Computational Plasticity – Fundamentals and Applications Barcelona, Spain3 - 5 September 2013". Barcelona: 2013.